Each year, some 25,000 hikers from all over the world walk the 43 km stone-paved trail, built by the Incas to get to the impregnable citadel of Mac hu Picchu, deep in the Cuzco cloud forest. The Inca Trail can be hiked year round although the months of April till October are probably more comfortable since the weather is drier. June, July and August are in the high season when the trail can become fully booked so be sure to make a reservation in advance. The 4 day Inca Trail is closed each year during the month of February to allow conservation work to take place. The months of January and March are in the wet season so hiking the trail can be a little miserable unless you have a good rain jacket and waterproof tent. 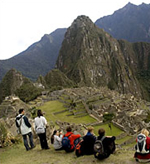 It is best to plan your Machu Picchu Tour ahead due to the site's popularity, and the fact that only a limited number of visitors are allowed each year. 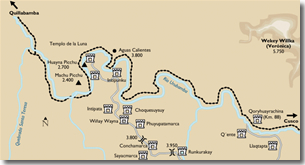 The Peruvian Government has restricted the number of Inca Trail trekking permits to 500 per day. With many individuals and groups vying for an opportunity to trek this spectacular route, obtaining permits has become a bigger challenge than ever. All of our 2005 peak season departures sold out months in advance and long waitlists were not uncommon.